Shrubs erect, 0.5--5 m. Bark gray, cracked and irregularly fissured. Branches alternate or whorled, rigid, angle of divergence about 30°. Twigs pale green, becoming yellow, then gray with age, glaucous, with numerous very fine longitudinal grooves; internodes 3--10 cm. Terminal buds spinelike, to 10 mm. Leaves in whorls of 3, 5--15 mm, connate to 1/2--3/4 their length; bases becoming gray and shredded with age; apex spinose. Pollen cones 1--several at node, obovoid, 6--10 mm, on short, scaly peduncles; bracts in 8--12 whorls of 3, reddish brown, obovate, slightly clawed, 3--4 × 2--3 mm, membranous; bracteoles nearly equaling bracts; sporangiophores 4--5 mm, exserted to 1/4 their length, with 4--5 short-stalked microsporangia. Seed cones 1--several at node, obovoid, 10--15 mm, on short, scaly peduncles (rarely sessile); bracts in 6--9 whorls of 3, circular, 8--12 × 8--12 mm, papery, translucent with reddish brown center and base, base clawed, margins entire. Seeds 1(--3), ellipsoid, 8--15 × 1.5--3 mm, light brown, smooth. Coning late winter--early spring. Dry rocky slopes to flat sandy areas; 500--2000 m; Ariz., Calif., N.Mex., Tex. ; Mexico in Baja California, Chihuahua, Coahuila, Sonora. 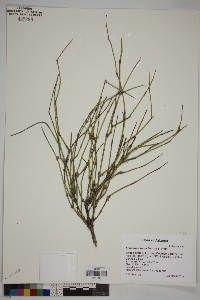 The hybrid Ephedra × intermixta is discussed under E . torreyana.